To enjoy a perfect game experience, there are a few factors you might want to pay attentions to before battle begins. Your Internet will be an essential ingredient whenever you have multiple people battling each other on a mobile device at the same time. You can check whether your Internet signal is stable by tapping it at the top right of the game log-on screen, confirming whether the game will be able to operate smoothly by adjusting it as cellular data or WiFi, based on your circumstances, so you can deliver an awesome performance. A suggestion would be to go into combat when the signal is green; a yellow signal might need some evaluation, whereas it would be advisable not to play the game when it is red, as this will severely impact your gaming experience. 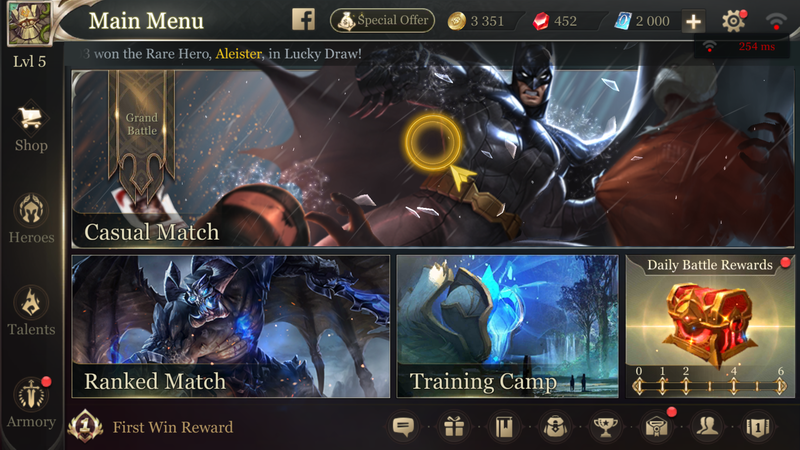 Fighting a single game in Arena of Valor will normally take around 10-20 minutes. This needs ensuring that you do not have any other matters to attend to, in terms of the following chunk of time when you start a game. The feeling of giving up the game at the point of victory because you need to attend to something else urgently is not only unpleasant, but may also affect whatever you need to do. Our recommendation would be not to play the game when in class or at work, as it will impact your work and also make it harder to focus on playing the game. So the experience won't be very good either. One very basic point would be to know your battery power level. It won't matter how much time you have, or how great your Internet is, if you don't have battery power. You might want to cry out in frustration should your phone suddenly shut off due to insufficient power. A recommended safe recharge level would be 20% or higher, to ensure that the game can come to a smooth end.